Companies that buy or make items to stock often believe that lowering inventory levels equals lowering service levels which will negatively affect sales. This is not true! It is possible to lower inventory levels without sacrificing product availability. The trick is to forecast with high accuracy and constantly optimize the ordering, both from a time and quantity perspective to ensure customer demand is met. 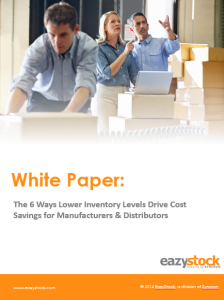 In this white paper, you will learn about the 6 ways lower inventory levels drive cost savings. We walk you through the different cost types and how those correlates to the inventory levels.